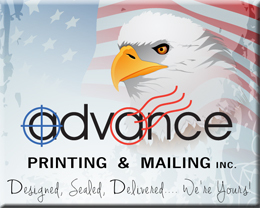 Printing – Advance Printing and Mailing INC.
Our attention to detail is superlative. In every stage of the printing process we pay complete attention to every detail. Customers that try us have commented that they continue to come back because of our quality. We have state of the art imaging equipment to allow the highest quality prints. When using print media, quality is very important to use as a first impression. We understand how important this is. Our goal is to give our customers a finished product that meets our standards. This means that we treat it as if it were our own. We will only give it to the customer if the work is of the quality we would use ourselves. To do this we start at the beginning. We look over the artwork carefully, even after the customer has given us a signed proof. (We have even caught misspellings of the customer’s own name that the customer had overlooked.) Then we look at the job at every stage in the printing process. By the time you receive your job, it has been looked over numerous times. The result is that your prospect or customer sees exactly what you want them to see. We can print business cards with Next Day service on basic card orders. Standard size is 2″ x 3.5″ with either horizontal or vertical design. Communicate with your audience and keep them informed with events, articles and coupon offers! Any style newsletter can be designed as a self mailer or be inserted in envelopes to be mailed out to customers, association or group members regularly. Saying Thank You should be done often and with style. Say it in a card and make your appreciation known! Custom printed to your size and made to fit a standard size envelope in the quantity that you need. An excellent way to give your customer the visual aspect they need to finalize their purchasing decision. Also perfect for seminar instructions and dissemination of any kind of information. Every one responds better to a visual stimulus. Booklets and Catalogs can be mailed or distributed by you as needed. Full color or Spot color “magazine” style printing to accommodate product descriptions or other demonstrations, etc. Formatting and sizing can be standard or custom to your needs. Impressive first impression looking highly professional in presenting your products and/or services to your prospective end users. Perfect for use at trade shows or handing out using the door to door method of sales. Also can be mailed out upon request from a website visitor. Preprinted inserts can add to the presentation and can be “stepped” for allowing different headings to show all at once to the viewer. Referrals are one of the best ways to get new customers! Hand out these cards to promote business with a simple offer, discount or as a valuable client referral and build your customer base. Pamphlets that either present products, services or food choices are another handy visual aid tool for end users.